The word "cosmopolitan" is often hijacked by glossy magazine covers, spiked cranberry cocktails and persons who murmur it with notes of condescension. Consult any dictionary, however, and you'll discover that to be cosmopolitan is to be internationally engaged and interested in all things outside of one's self. 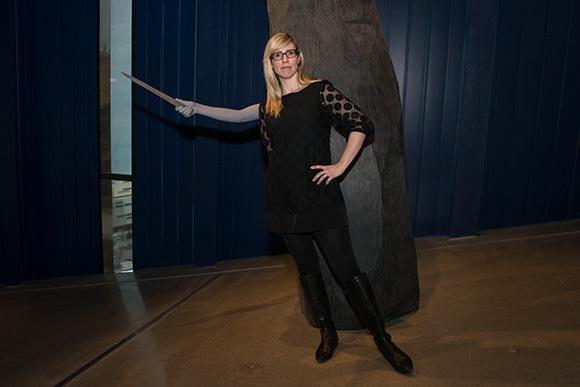 "It has more to do with a global mind set," says Megan Lykins Reich, deputy director of the Museum of Contemporary Art Cleveland (MOCA), "which is a definition that feels very authentic to what we strive to do with our visitors and with our program – to connect Cleveland with the world through artist and ideas." To achieve that goal, MOCA commits broad-based support to international artists. The museum further adopts the concept by showcasing local artists alongside them, thereby interjecting Cleveland's contemporary art scene into the global dialogue. "It's not about trying to make Cleveland New York or Berlin," says Lykins Reich. "It is saying that those cities share the sensibilities of having a variety of activities and ideas swirling around them. We want to import some of that energy and that kind of open spirit into our program and connect it with Clevelanders." Hence, each of MOCA's exhibits is carefully selected based on its impact on the patron viewing it, the surrounding community and points across the globe. Subtle messages within exhibits also contribute to the to the organization's efforts to tether Cleveland's cultural efforts to the world at large. One such nuanced example, ironically, focused on a piece of art that sits a half mile away from MOCA's Euclid Avenue home. Nevet Yitzhak: OFF THE RULING CLASS In fall of 2015, OFF THE RULING CLASS revisited one of Cleveland's most enduring icons, The Thinker, via a video installation in MOCA's free public space. Rodin's studio produced more than two-dozen monumental casts of the work, but Cleveland's Thinker is different. Unlike many of his brethren, he was created directly under Rodin's supervision in 1916. He became part of the Cleveland Museum of Art's collection in 1917. On March 24, 1970, however, the static work suffered a violent transformation. "It was a bombing," says Lykins Reich of the infamous vandalism. "The object was horribly traumatized." The statue was disfigured and knocked from its plinth, upon which "OFF THE RULING CLASS" was scrawled by perpetrators who were never apprehended. Despite its mangled and missing limbs, the museum opted to reinstall The Thinker back in his rightful spot directly in front of the building facing the reflecting pond. Snap to 2015. A curatorial research trip to Israel delivered unto MOCA Nevet Yitzhak, whose work is based in video and artifact. "We brought Nevet in and we said, 'look around.'" After an exhaustive tour of public and private collections, Yitzhak came to a decision and, recalls Lykins Reich, the artist reported, "I'm going to do something on The Thinker," stunning everyone associated with the project. 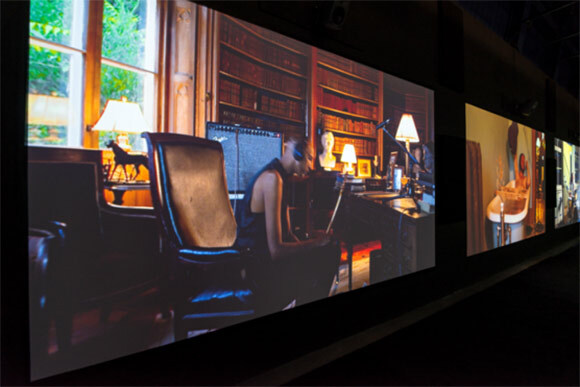 Yitzhak created a two-channel video installation. 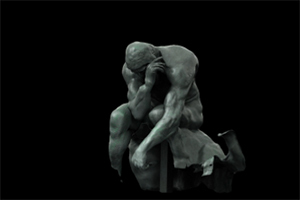 One screen featured an animated three-dimensional Thinker pondering his mutilated body. The other, THE ANTITHINKERS, nodded to documentary by chronicling the 1970 bombing with archival photographs, video, and newspaper clippings along with newer documentation of the sculpture’s annual conservation. At once, The Thinker was reborn just ahead of his 100th birthday. This time, however, he stepped onto the world stage courtesy of a stalwart Cleveland vanguard and an international artist. All the while The Thinker pondered us unapologetically from his marble perch, but when his alter ego arrived at MOCA via the videos, he was never more vulnerable and sympathetic. Yitzhak's reanimation of him had another subtle and devastating message. It brought heartbreaking incidents such as the 2015 destruction of the Temple of Bel in Palmyra at the hands of ISIS and the Taliban's 2001 dynamiting of the Buddhas of Bamiyan very close to home. "This is something that has happened on global scale throughout history," says Lykins Reich. "People have aggressively targeted art in order to try and cripple a society. If we feel we're detached somehow from that issue because it's happening across the pond, what Nevet did was sensitively bring it back home and say, 'this happened right here.'" Hence, it took an Israeli artist to project Cleveland's unique Thinker through an international lens, which is a definitive example of how MOCA achieves its cosmopolitan mindset by being at once globally minded and locally rooted. An international conduit since its inception in the late 1960's, MOCA has always been a non-collecting museum. Hence by its very nature, that feature nurtures the concept of growth and exploration. To that end, curatorial staff and guest curators have traveled over the past year alone to approximately a dozen locations including Tel Aviv, Beijing and Rome as well as New York, Los Angeles and Chicago. "We don't have to go abroad to be cosmopolitan," notes Peter Vertes, MOCA's director of marketing and communications. "A trip to New York can bear international fruit." "Or Miami or Denver," adds Lykins Reich. Yoshitomo Nara 2004While the move to the Uptown location in 2012 proved pivotal for the institution, Lykins Reich, who's been with the museum since 2004, notes that MOCA's international flair spans her tenure and beyond. She cites exhibits with Christo, Jim Dine and Roy Lichtenstein as well as a radical Italian Arte Povera show in the organization's early years at previous locations. 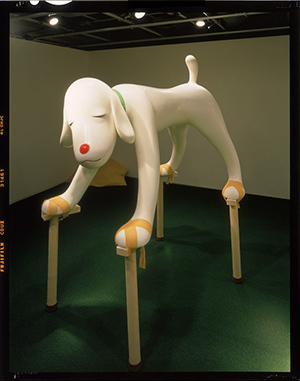 The mid-aughts brought the evocative sculpture of Japanese artist Yoshitomo Nara in 2004 and Russian artist Ilya Kabakov in 2006 among others to the Carnegie Avenue location. Nonetheless, the second floor of a converted Sears and Roebuck department store has its limitations. "We had a cosmopolitan program in the old building," says Lykins Reich. "What we didn’t have was a cosmopolitan space." In 2012, MOCA finally moved into a proper home designed and built solely to serve the museum's mission: architect Farshid Moussavi's dynamic building at the corner of Euclid Avenue and Mayfield Road. "This building matches the program to the environment. It transports people. It feels like it could be in any number of places in the world because it has this sense of being other and unique and beyond," says Lykins Reich, adding that the building's stunning reflective exterior is also representative of MOCA's goals. "The building is a mirror of the world around it, which is another metaphor for cosmopolitan," she says. "It is a mirror of our program." From the first show in the new building, Inside and Out and From the Ground Up, which featured the likes of Brazilian artist Henrique Oliveira's massive sculpture crafted from Brazilian wood and pieces of local refuse next to the work of Barry Underwood, a professor at the Cleveland Institute of Art, to efforts such as Ragnar Kjartansson's The Visitors in 2015, which took a group of Icelandic performers in a Hudson Valley house and transported them to nine screens in MOCA's Mueller Family Gallery, the museum has consistently courted the international art set and tethered its work to the American experience. Furthermore, in the case such as Underwood's art being displayed amid that of Oliveira and Canadian sculptor David Altmejd, the museum reverses the lens, and catapults the Cleveland art scene onto the international stage. "Showing how Cleveland artists are in dialog with the rest of the world is also about creating a global mindset and connecting here to there," says Lykins Reich. MOCA's current offering, Stranger, she adds, further exemplifies the point. "Stranger is an example of this international vantage point where we're bringing in nine artists from across the world," she says, noting that they include those close to home such as Cleveland-born Cécile B. Evans and others such as Andro Wekua from the Eurasian country of Georgia. "These are artists working in every medium you can imagine, all dealing with this similar topic of representation, something that is very familiar," she adds, tagging the exhibit's themes of figuration and portraiture. "Once you get within the show, these become topics that are relevant and real for our audience here." 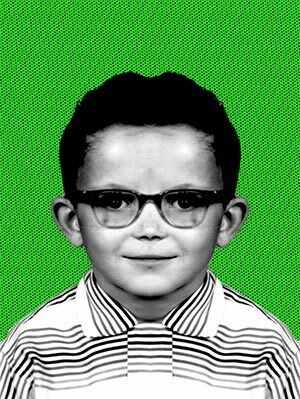 The idea of Northeast Ohio carrying its own weight on the international contemporary art stage will fire on all cylinders this summer when the museum welcomes Mark Mothersbaugh's multi-media exhibition Myopia. Born in Akron, Mothersbaugh is best known as co-founder of DEVO, but he is also a visual artist and award winning composer whose credits include films such as "The Royal Tenenbaums" and "The LEGO Movie" as well as quirky productions like "Pee Wee’s Playhouse," and the Rugrats franchise. The show, held in collaboration with the Akron Museum of Art, will surprise and delight fans of DEVO as well as contemporary art aficionados with objects such as Ruby Custard, which features a ruby that is, per Lykins Reich, "like the size of your head – at least. That's a big ruby." Cranium-sized gemstone aside, the exhibit celebrates the cosmopolitan spirit of an artist with a contemporary and elaborate body of work who is also deeply rooted in our community. "He is clearly one of the greatest creative geniuses of our time in terms of his hybrid practice and the ability that he has to move across disciplines," says Lykins Reich. "He is an ultimate expression of what it means to be a contemporary artist today. In many ways, he is the missing link that hasn't been examined. This kind of an artist that successfully navigates visual art practice, music, sculpture, performance – all of these things – and do them on equal footing makes him the ultimate cosmopolitan expression as well." All of it culminates to substantiate MOCA as Cleveland's portal to the contemporary art world at large, while it remains deeply rooted to its community. "That's very important for us – that we demonstrate the exceptional work being done here to the world," says Lykins Reich. "As our reputation continues to grow and build, the world pays more and more attention to what we do with our local community," she adds. On Friday, May 27 from 7:30 to 10 p.m. on Toby's Plaza in front of MOCA, the museum will host a free concert and outdoor party to celebrate the opening of Mark Mothersbaugh: Myopia. Mothersbaugh will perform live with local musicians playing his six-sided keyboard. A six-piece band will also perform songs from Mothersbaugh’s extensive opus.